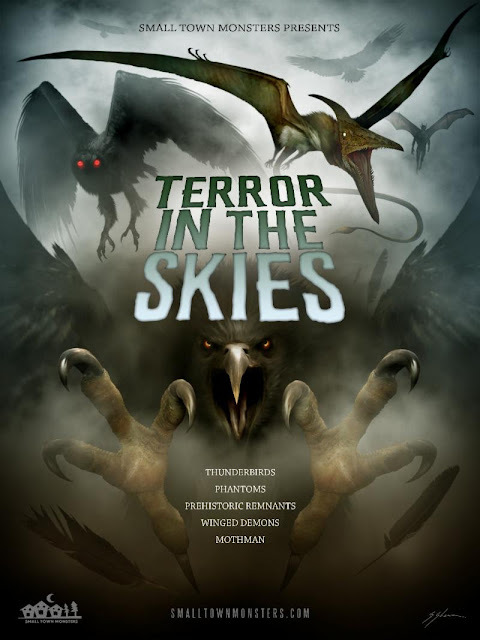 Small Town Monsters has released the first trailer for Terror in the Skies and outlined their plans for 2019. Director Seth Breedlove explores hundreds of years of terrifying reports of encounters with massive, winged creatures around the land of Lincoln. From Alton's man-eating Piasa Bird legends to recent sightings in Chicago of a creature said to resemble Point Pleasant, West Virginia's infamous Mothman, Terror in the Skies unlocks a centuries-old mystery. Small Town Monsters is funding Terror in the Skies, as well as a second film (MOMO: The Missouri Monster) through a Kickstarter campaign which is now running through 9th March 2019. The campaign offers backers the opportunity to have their names added to the credits of the films, or have the chance to appear on-camera, alongside posters, apparel, DVD copies of the films and more.